People finally driving less -- good! With gas prices rising steadily over the past decade -- even before the recent levitation -- there's been a question nagging at economists: at one point would consumers break? When would the elasticity of demand start to show? Obviously Americans would drive a lot less if gas were $35 per gallon, but at would point would consumption start to slow. 2008 appears to be the year, and $4 appears to be the beginning of the breaking point. 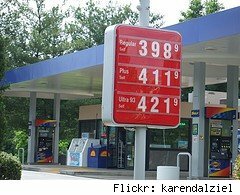 Cambridge Energy Research Associates reports that "U.S. gasoline demand will likely decline in 2008 for the first time in more than 17 years. For the first time since the 1970s and early 1980s the number of miles driven by Americans has clearly begun trending downward." In April, Americans drove 1.8% fewer on public roads compared to the same period last year, the sixth consecutive month of declines.Good! People need to drive less, spend less on gas, and exercise more. Since 1998, the number of miles driven has gone from under 2.6 trillion per month to over 3 trillion before a slight decline this year, according to the Federal Highway Administration. That's a gain of about 20%, substantially higher than the population growth rate over that period. Once you factor in the rise of telecommuting, online shopping and big-box stores over that period, it's actually sort of mind boggling that people have found a need to drive that much more. Where exactly are you people going? If you're looking for an fuel-efficient alternative to driving, check out today's Daily Deal: a 12-inch Dora the Explorer bicycle. I hear it's a chick magnet.